People complain when their feet get sore, the University of North Texas has learned. For years, when visitors were asked what they disliked about the campus tour, the resounding answer was: all that walking. Parents didn’t like trekking around in the heat, and they weren’t too keen on the cold either. There had to be a better way, North Texas officials decided, to show off their 884-acre campus. “It was like a death march trying to get from one end to the other,” says Jennifer McLendon, the university’s visitor-experience manager. So three years ago, North Texas bought two 14-passenger electric trams, which can go up to 20 miles per hour. Now the tour has two parts: Guests walk through the heart of the campus, and a tram takes them around the perimeter, stopping several times along the way. The open-air vehicles have hard tops that block the sun, and in the winter, when temperatures can dip into the 30s, clear plastic flaps cover the sides. North Texas is one of at least a dozen colleges that in recent years have adopted a walking-riding hybrid for tours. With buses, vans, golf carts, and Segways, today’s campus visits often rely on wheels. I like the idea of lots of different kinds of vehicles ferrying visitors around campus and where the acreage is big there probably aren’t too many alternatives. 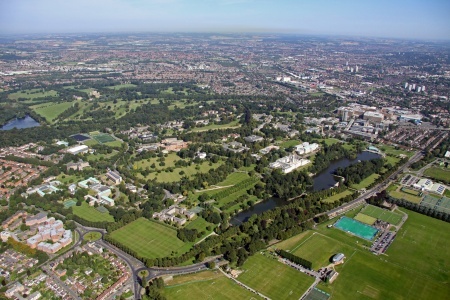 University Park – University of Nottingham. Quite big. With a very large campus at University Park and multiple other campuses in and beyond Nottingham, the University of Nottingham inevitably has to provide buses for visitors on open days. We have yet to resort to buggies and Segways but, as this earlier True Crime on Campus post noted, a golf buggy has been seen on campus before. And of course from late 2014 we will have a new Tram service running through University Park. This entry was posted in Admin, HE, Students, True Crime on Campus, University of Nottingham and tagged Administration, buses, campus, campus tours, Chronicle, HE, North Texas, open days, Students, Tram, transport, University of Nottingham by Paul. Bookmark the permalink.